How to Easily Master Format NOKIA LUMIA 530 with Safety Hard Reset? Tips and tricks for solving NOKIA LUMIA 530 problems. The NOKIA LUMIA 530 is the smartphone which use Windows Phone 8.1 as factory default operating system / firmware. If we would like to see some specification review of NOKIA LUMIA 530 then it would almost the same with Nokia Lumia 520. What are the improvement at NOKIA LUMIA 530 if compare by Nokia Lumia 520? Internal memory at NOKIA LUMIA 530 become 8 GB while only 4GB. Processor at NOKIA LUMIA 530 become Quad core 1.2Ghz while Nokia 520 only Dual core 1Ghz. Most of specifications are identical. What to do to Fix Problem or Recovery NOKIA LUMIA 530 hang or not responding or malfunctions or stuck or freezing or bricked ? When the first time we use NOKIA LUMIA 530, we will get several factory default applications inside this phone. However, we still can download many applications from Windows Phone Store. Please remember, for make our NOKIA 530 phone able to download applications from Windows Phone Store, we should activate or create Microsoft account first. But be should also have to careful of some applications from that apps store which can not work perfectly at our NOKIA LUMIA 530, sometime it can make our phone become trouble or get problems like hang or stuck or bricks or broken or blank or boot loop or LCD touch screen not responding. When we get this problem, please force to shutdown or soft reset or reboot NOKIA LUMIA 530 for remove some temporary files or cache which can make the phone become trouble. If we can not solve the problem, then we should do hard reset or master format at our NOKIA LUMIA 530. How to Force Shutdown or Force Soft Reset or Reboot or Restart NOKIA LUMIA 530 ? Please perform the shutdown or soft reset or reboot the NOKIA LUMIA 530 when the phone stuck or frozen when we play or running some applications. The Nokia Lumia 530 battery is removable, so we can open the back case and unplug / remove the battery when this phone freeze or hang. After the battery has removed, wait about 5 seconds and put again the battery at the right positions. Press Power button to turn ON the NOKIA LUMIA 530, at this time we already finish doing soft reset. The alternative for force shutdown or force soft reset NOKIA LUMIA 530 without open the back case and remove battery is using POWER button. Press and hold POWER BUTTON for several second until the phone shutdown by itself, if you see ‘slide down to power of‘, do slide the icon at this phone then NOKIA LUMIA 530 will turn off. We need to press Power button again to turn on NOKIA LUMIA 530 on again. How to Master Reset NOKIA LUMIA 530 to Factory Default ? The NOKIA LUMIA 530 will do the hard reset format, wait about three until five minutes. While waiting you will see the gear appear until it finish. When our phone start to act not normal or strange, maybe some trouble happen at our NOKIA LUMIA 530. Some problems usually happen because the applications causes. We can try to find and uninstall that applications, but this solutions will not fix the problem if the operating system has already damaged or broken. At this point, we should reinstall or restore clean factory default Microsoft Windows Phone operating system or firmware at our NOKIA LUMIA 530. We should know that the file source of Windows Phone 8.1 operating system already saved inside NOKIA LUMIA 530 ROM. So we do not need to copy anything or connect to any gadget when we need to reinstall or restore the firmware / operating system. Please follow the hard reset or master format steps above, then the factory default operating system or firmware will be reinstall automatically. But please remember, doing reinstall the operating system will clean all important data at our NOKIA LUMIA 530 internal memory, therefore please do backup all important data from our NOKIA LUIA 530 first before performing reinstall or hard reset. How to Unlock or Fix or Bypass or Solutions for NOKIA LUMIA 530 forgot password code or security lock screen or pin (lost password)? Some users also saved many important and confidential data, important pictures or movie. This data will easily access or view by other unauthorized people when they get our phone or when our NOKIA LUMIA 530 away from us. Therefore we should have give security protections to make other people not easy to access our data. The problems happen when we forgot security protection password pin answer. Please write our password protections at safe area, because is we forgot the password protections then we should have to do hard reset or master format, and all internal data also will remove after doing hard reset. How to Improve Performance NOKIA LUMIA 530 to make run more faster? After use several period, some users get problem with slowly performance of NOKIA LUMIA 530. Usually this problem happen because applications problem, there are too many applications that has installed or run in the background that can make the NOKIA LUMIA 530 run more slowly. Please remove some not use applications. However, we can make our NOKIA LUMIA 530 performance run more faster again like new by doing hard reset or master format. What is the Secret Code Key for Hard Reset NOKIA LUMIA 530 ? There is no secret code for doing hard reset or master format NOKIA LUMIA 530. Just follow the step above to hard reset is the easy way to do. [A] Hi, please find icon with contact name or you can try to call someone then you will find menu to find contact name. However, of your phone corrupted, then please backup all important data and continue performing hard reset is recommended. [A] Hi, usually when the hardware still normal, then your Nokia Lumia 530 can be reformat using hardware button combination key. Please try to follow steps at #option 2 above to reformat your Nokia Lumia 530 operating system to factory default. Otherwise if still can not work, then you should check the hardware troubles at Nokia authorized service center. The information from this page describe about how to reset nokia lumia 530,Nokia Lumia 530 hard reset,nokia 530 hard reset,how to hard reset nokia lumia 530,How to restore lumia 530,hard reset nokia lumia 530,how to restore Nokia Lumia 530,how to delete microsoft account in lumia 530,How to reboot Nokia Lumia 530,code formAtAge nokia lumia 530. If you need another resource for hard reset, use search function at this homepage or find from our related posts. How to Easily Hard Reset ASUS ZENFONE C (ZC451CG) with Safety Master Format? Hi, unfortunately you can not bypass or unlock forgotten security password at Nokia Lumia 530 without remove all data or reformat or hard reset to factory default. 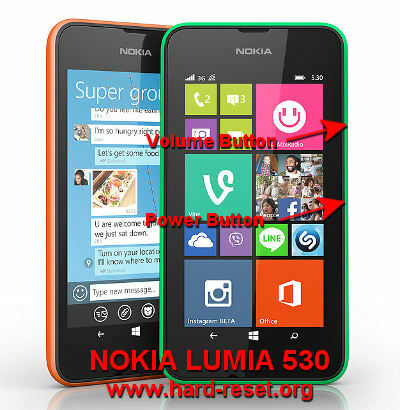 Please follow steps to hard reset Nokia Lumia 530 using hardware button combination key at #Option 2 steps above. Hi, it seems that your Nokia Lumia 530 are provided for specific mobile operator only (locked to mobile operator who release this product with special price), therefore you can not use this phone with other provider. To make sure about it, you can try to bring your Nokia Lumia 530 to your mobile operator or to Nokia authorize service center for further check. Hi, my Lumia is just blank, it has no home screen therefore I can’t dial or do anything except to receive calls. I do see who is calling on the screen but that is all I see and it does have the screensaver but when I slide it up there is nothing except the battery capacity. Please help how I sort it out without formatting everything. Sorry, I forgot to mention that I have the Nokia Lumia 530. Hi, at this situations, the only alternative way that you can try is doing hard reset your Nokia Lumia 530 using hardware button combination key at #Option 2 above. Please follow that steps carefully. If you Lumia 530 have external microSD card, then please remove this card first before doing hard reset. Hi, please try to do hard reset your Nokia Lumia 530 with hardware button combination key like steps at #options 2 above. Please make sure your battery is fully charger before doing hard reset. This process will reformat your Nokia Lumia 530 to factory default. Hi, if everything fine include your Nokia Lumia 520 hardware button, then you can try one more time carefully reflash your phone using hardware button combination key. Please follow steps sequentially. Hi. My micro sd gets in trouble and I can’t see my files saved on it,the worst is I install important apps on it so I can’t open even facebook or viber. So I reformat my sd card and uninstall the apps that is listed already in my nokia lumia 530. But when I tried to download and install again it’s not working,in short I can’t download facebook,instagram,viber and skype anymore or even any apps. What should I do about this?thanks. Hi, maybe your MicroSD card have already get corrupted and it is start working not normal. Please try to reformat your MicroSD card using card reader and do format at computer, then try again to install several applications at your Nokia Lumia 530. But if still get trouble, then we suggest to replace with new one. Hi, you need to go to Microsoft website to reset your forgotten security password before login to Nokia Lumia 530 or other Microsoft device. Please start to browse from https://account.live.com/resetpassword.aspx. I tried these steps for my nokia lumia 530, But its not happening with me.. I pressed down button after i pressed power button. Then i got the exclamation mark screen. now when i press the Up button in sequence (i.e up down power and down) my phone get restarted before completing the sequence and i’m again on the lock screen for which i have forgotten the lock code.. 🙁 any help? Hi, this steps can run without problems for some Nokia Lumia 530, but maybe some case can not hard reset with hardware button combination key because hardware trouble and need to get further test at Nokia authorize service center. Hi, you better try to uninstall some not use applications at your Nokia Lumia 530 to give more free capacity. The full memory also can happen because you have a lot of downloaded files or photo pictures or video recording inside internal memory. Please try to browse all files inside your internal memory and move it to external microSD card. If still not work, then you have to backup all important data, and reformat your Nokia Lumia 530, then try to update phone software again directly. Hi , my volume and power button fell out of my phone so I can’t find it. And I just recently forgot my password to my Nokia Lumia 530. Is there any other way I can do a hard reset? Plz help me. Hi, the only steps that you can do when you forgot Nokia Lumia 530 password is by doing hard reset or master format using hardware button combination key, but that steps need hardware button such as Power button and Volume button work. Please bring your Nokia Lumia 530 to service center for further service. Hi, please try to do hard reset using hardware button combination key like steps at #option 2 above. But this steps maybe not work when your Nokia Lumia 530 get hardware trouble, you need to fix at Nokia authorize service center. Hi, usually when your Nokia Lumia 530 received phone call, you still can navigate LCD screen with finger touch. However, maybe you ever install some applications that make this problems happen. Try to find that apps and uninstall them. If you can not find that apps, then you have to consider doing hard reset to factory default your Nokia Lumia 530. Hi, if you do hard reset, then all applications will be remove and the operating system of your Nokia Lumia 530 will be reinstall to factory default. Please do it carefully as backup data as you can. Hi, please try again to follow steps to hard reset your Nokia Lumia 530 using hardware button combination key like steps at #option 2 above, mostly it will work without problems, but you have to do it steps by steps start from BIG STEP A and continue until finish. Hi, better you try to do hard reset first to make sure your Nokia Lumia 530 operating system not corrupt or to make sure there are no bad applications which consume too much resources at your Nokia Lumia 530. Hi I’ve forgotten my password and when I try to do the hard reset the exclamation mark won’t appear on my phone screen what do I do now? Hi, the only steps to recover forgotten security password protections at Nokia Lumia 530 is using hardware button combination key like steps at #option 2 above. Please note, that steps have to be perform sequential, you have to do from Big Step One and continue until finish. Hi, maybe your Microsoft account is blocked or get some trouble, please try to login using browser at Microsoft Live website to make sure your Microsoft account still work properly. Hi, usually this problems can be solve using hardware button combination key like steps at #option 2 above. Please try to do it again carefully to reformat your Nokia Lumia 530 OS. I hope you could help me with my lenovo s1a40 problem. the problem is, my phone lights keep turned on and off turned on and turned off showing the “LENOVO” logo in the middle and powred by android in below. I tried reprogram or reboot or wipe the data by process but it wont let me continue due to the phone keeps turning off and on every 3sec. when it turned off i have to go back to start and the lenovo logo is showing again. Hi, because you have done hard reset but the problems still happen, then perhaps the hardware of your phone get troubles, please consult with your Lenovo authorized service center. Hi, usually when the hardware still normal, then your Nokia Lumia 530 can be reformat using hardware button combination key. Please try to follow steps at #option 2 above to reformat your Nokia Lumia 530 operating system to factory default. Otherwise if still can not work, then you should check the hardware troubles at Nokia authorized service center. Hi, please find icon with contact name or you can try to call someone then you will find menu to find contact name. However, of your phone corrupted, then please backup all important data and continue performing hard reset is recommended.